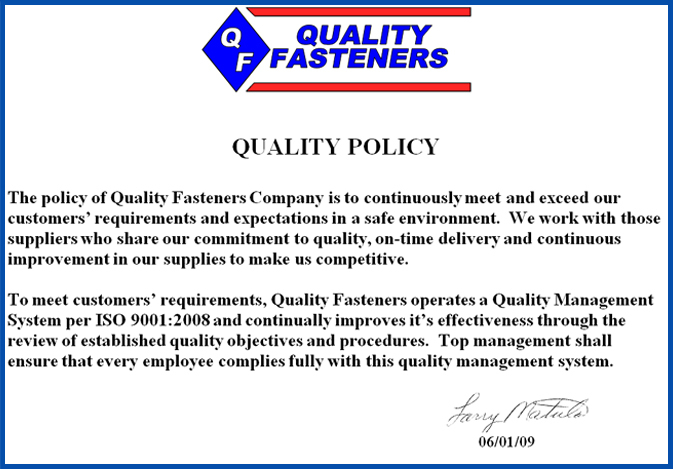 Welcome to Quality Fasteners “specializing in hard to find items.”For over 30 years, we have been building a solid reputation as a premier supplier and distributor of quality fasteners, related hardware and the tools you need. We are ISO 9001:2008 Certified and offer over 25,000 items for a wide scope of applications. We take pride in always keeping our inventory well-stocked and in having more metric and stainless steel than anyone else in the area. In addition, we have a knowledgeable and experienced staff ready to assist you and if we don’t have the item on hand that you require…we can special order it for you. So if you‘re looking for bolts, nuts, washers, threaded rods, cutting tools, abrasives or anchors…pipe fittings…electrical terminals…lubricants and cleaners… hand and power tools…springs…metric fasteners…industrial supplies…brass fittings …shop our online catalog. If you don’t see the item you need…give us a call at 210-656-2323. We also invite you to check out our money-saving specials and be sure to come back often to see what’s new. Plus, we have nationwide shipping capabilities by ground and air…and we are your choice for Inventory Management Services in Houston, Ft. Worth, Dallas, San Antonio, Austin, and the surrounding areas to help ensure that you have what you want, when you want it, at a fair price.